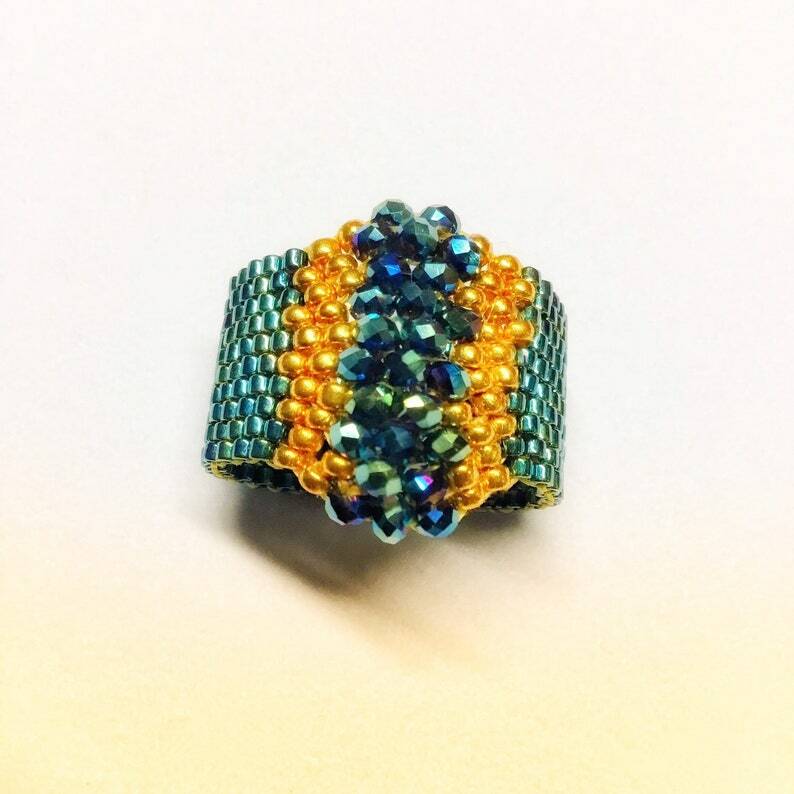 This listing features a coctail seed bead ring that can accompany you on all your glamorous night outs. 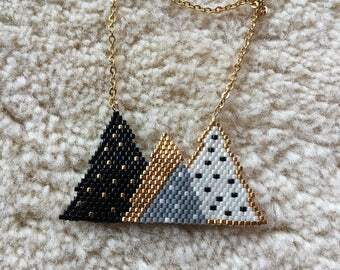 It has been designed and crafted by me, with love, care and inspiration, using premium quality Japanese glass seed beads and Czech Fire Polished beads, in shimmering green blue color blended with yellow polished gold hues. SouSou jewelry is made only with the highest quality materials and with proper care it could last a lifetime! Each tiny bead has been woven one by one, using an off-loom technique, called 'peyote stitch' and a highly durable thread for weaving. 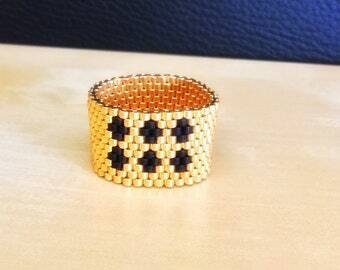 The different size of the beads used, give this 3D effect, that make the ring an eye catcher. 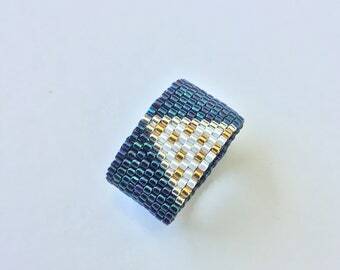 Bead-woven rings are great for anyone with metal sensitivities, as they are made only with glass beads. They are also very lightweight and comfortable, you can hardly feel them on. This ring is approximately 1.4 cm (0.5 inch) wide. It is a 8 US size (57-58 EU size). If you need a different size, you can choose it from the list above, or message me. If you don't know your size, you can follow the instructions below. For converting to other international sizes corresponding to US, use an International Ring Size Chart, like the ones in the last photos. 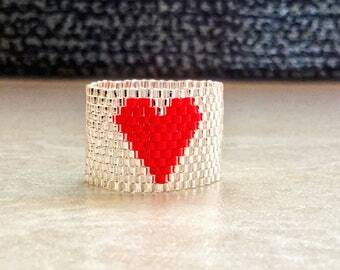 You can wear the ring alone or match it with other pieces from SouSou’s Etsy shop, for a stunning look! - Make sure your finger is at a normal body temperature; fingers can shrink or expand when cold or hot. - Use a thin stripe of paper (about 1 cm width) and wrap it around your finger; make sure the paper is below the joint of your finger and close to your knuckle. - Mark the spot where the paper meets and measure the paper distance with a ruler. - Use the following chart to find your ring size. Rings also come in half sizes, in case your measurement falls in between two whole sizes. In that case, it is advisable to order the larger size. 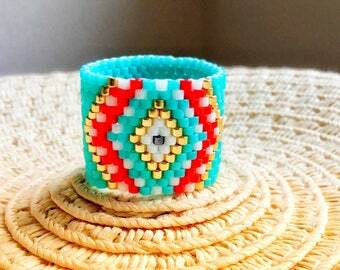 Please be certain of your ring size when ordering a beaded ring. Custom rings cannot be exchanged or returned because the wrong size was ordered. Returns and exchanges are provided only if the ring is defective. 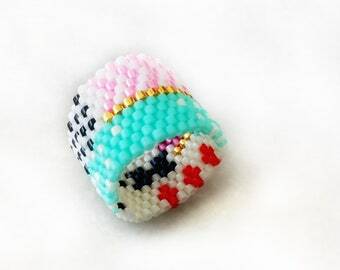 All SouSou rings are tightly woven and do not stretch.